Pre-production livery samples of the SR Black and the BR black versions of the eagerly awaited ex SECR C Class 0-6-0 were released by Bachmann a short while ago now and can be seen on the Bachmann website here. Having had the chance to see and handle the pre-production samples I can say as models go it is a cracker. The livery application for the complex SECR liveried version was always going to be a challenge and I am sure that some people out there did/do not think Bachmann would be able to pull it off. I am pleased to report that having looked over the livery sample at the weekend they have managed it with aplomb. This livery application is crisply carried out with very fine lining and excellent definition between the colours. The fine level of printing on the model even extends to the minute SE&CR lettering on the Tender axleboxes! I should add that the livery on this model is as per the style applied to 592 on the Bluebell Railway and may not be strictly accurate to the livery it would have worn in true SECR pre-grouping days as for example I believe the steam reverser would also have been fully lined (a challenge in its own right). I was also impressed with the level of back head detail and painting in what is a very open cab and could well be one of best from Backmann yet, whom in my opinion have lagged behind Hornby in this area for some time, but recent models have certainly improved in this respect. I am very much looking forward to adding the C Class to my fleet, albeit the somewhat duller Southern Bulleid ‘Sunshine’ Black livery, as they will be very appropriate for one of the other layouts that I have planned based on Hawkhurst in Kent, for which I already have most of the required rolling stock and some of the buildings completed. Larger version of all the images can be seen by clicking on them. Thanks Graham. i should really have the black Southern Sunshine version for my BroadTemple layout but am now tempted to go for the SECR too to run alongside my LSWR M7and T9 and LBSCR Terrier in pre-Grouping mode! Probably beyond even the extremes of modellers’ license but there you are. 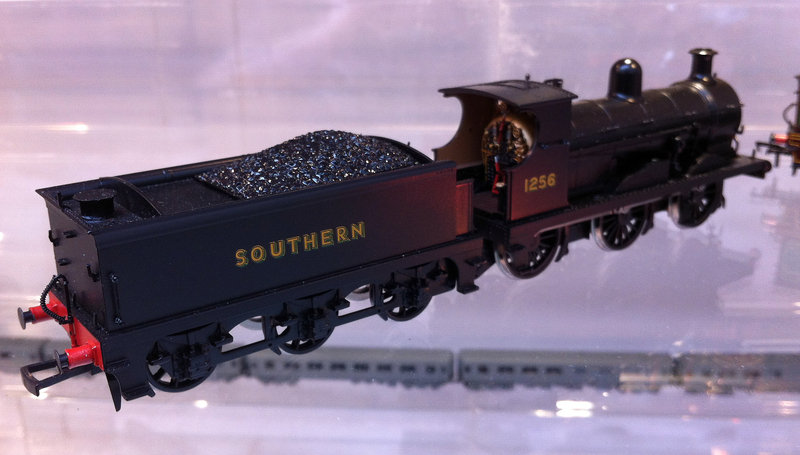 I have at least one black sunshine on order but I must admit the SECR version does look good. I would add that it is likely to be a few quid more than the black version purely due to the livery application costs. Lovely Graham! Do you know how different the fittings are from its pre-grouping appearance? Wouldn’t mind tackling retro-fitting equipment, but I’d hate to spoil that lovely livery! I don’t think there are many differences and they most likely to be quite minor such as the lining to the steam reverser as they seemed to line anything they could at that time. I know the chimney changed during their lifetime but the Bachmann moulding allows for three different types already. I will need to study a few photographs to get a bit more of a definitive answer. I note that the letering also includes Longhedge works on the number plate, Is it also on the Tender. The BLuebells exampole does of course have a lined steam reverser I wonder whether Bachmann will get around to it on the production version. Graham – that looks fabulous. Any news on a SR Maunsell black version? Good to hear from you I hope you are well? When Bachmann first announced the C Class I expected the Southern Black version to be the Maunsell livery and was a little surprised when it ended up as Bulleid Sunshine. I am sure that this will be a popular loco and therefore further batches will be produced and the Maunsell black must be on the list of options I am sure but possibly at least 12 months away. Absolutely wonderful. I think the preserved version may have a tall chimney, as originally fitted when built; do you know if this will be catered for? Yes Bachmann have allowed for three chimney types. 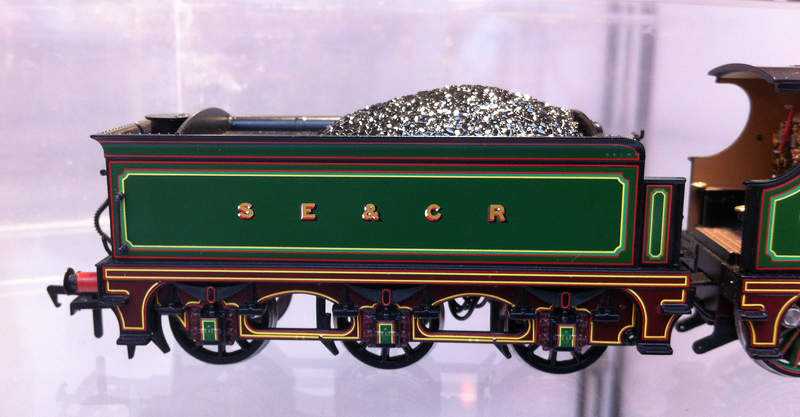 The SECR Version has a taller chimney than the SR or BR versions. Like Barry, I can’t really justify the ‘full Wainwright’ version. But it’s so utterly splendid that I’ve had one on pre-order for quite a while now*. I should really have the BR black (either crest) on my late-fifties layout, ‘Hectorage Rd’, based on 74D. But no sooner had I spent a lot of money on a kit-built and beautifully weathered ‘C’ – yes, with sound & smoke too – than Bachmann announced their very reasonably priced and equally unexpected loco. But, of course, you can’t have too many ‘C’s at 74D. Might we expect a ‘D’ or an ‘H’ soon? A 74D ‘H’ would be good for Hawkhurst! The C Class (owned by the Wainright C Class Preservation Society) does have a lined out reverser, a series of lines at teh top and bottom of each section. I assume this is missing on the model due to the size of the reverser! We need a brake van for the SECR C class. 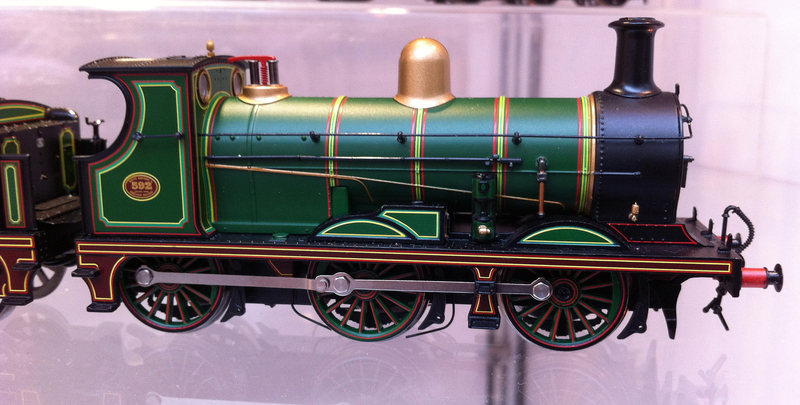 Perhaps a repainted Hornby LBSCR brake would do. Rather than running the C class on an existing layout you could build a small diorama using Bachmann’s Sheffield Park Station to display the C class. Well depending on the era of course the Bachmann 25t pill box brake van is also more then suitable. Whilst not ready to run, Cambrian Models do a very nice SECR dance hall brake van kit which is not to tricky to assemble and certainly looks the part. A few disappointing features.Cab/tender handrails are moulded,rather regressive by todays standards.Also brake blocks moulded as part of the frames,if Hornby are able to do blocks in line with the wheels,then it shouldn’t be to hard for Bachmann. Yes I too since my initial review post have taken another look at the tender brake blocks and agree that they could have done better, their 3F is similar although the representation of the springing on the 3f is worse than the C class. I think that we shall be seeing more moulded detail on models to come where improved techniques allow for some moulded details to look as good as separately applied items in some instances. I’m now in possession of no less than two of the SECR versions (one for a friend and one as a ‘secret’ present for me). I’ve tested them both and they run beautifully – smooth & quiet. My only regret is the dreadful shiny coal. It’s easily remedied with the addition of some real coal dust but it’s over-full now.. Apparently they’re all sold out already so maybe Bachmann will be encouraged to do the ‘D’ at the NRM next! . Good to hear from you as always, I trust that you are well. I agree thatthe coal load is far too shiny and will be covering mine with real coal too, which I do on all my models anyway. Although the first manufacturing batches have been sold out at Bachmann I am sure other batches will be produced in due course. Once again I see that some retailers have been caught out not ordering enough stock to cover pre-orders (usually to keep their financial commitments lower trusting that they will be up the order at the last minute) which lets a few people down but stock is still available from other retailers should buyers shop round a bit.